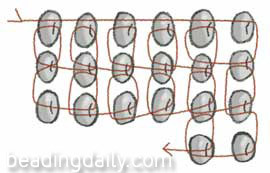 Begin by stringing a row of beads. For the second row, string 2 beads, pass through the second-to-last bead of the first row, and back through the second bead of those just strung. Continue by stringing 1 bead, passing through the third-to-last bead of the first row, and back through the bead just strung. Repeat this looping technique to the end of the row. To make a decrease, weave thread through the previous row and exit from the bead adjacent to the place you want to decrease. Continue working in square stitch. To make an increase, string the number of beads at the end of the row you want to increase. Work the next row the same as the previous row. See also Circular Square Stitch.